Buy cardboard bicycle boxes in Durban from Pack Now. We sell double wall cardboard bicycle boxes directly to the public. Our bike boxes are strong and perfect for traveling and storage. Our cardboard bike boxes are made as in lid and base structure. 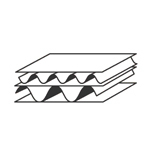 The lid and base structure provides double the strength on the corners.